The attacker on Monday was on foot, police said, as they reported multiple casualties among the bus passengers who were “employees of a foreign compound” later identified as Nepaleses on their way to the Canadian embassy where they worked as security guards. The Taliban took responsibility for the attack, a spokesman for the group confirmed. The incident follows a suicide attack on a bus near Kabul last month and an attack on a court in Ghazni in June. 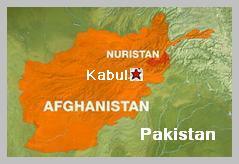 Both attacks were claimed by the Taliban in revenge for the execution of six prisoners. Less than three hours later, another attack in eastern Kabul injured and MP and five others. A security official said a magnetic bomb planted in the vehicle of MP Ataullah Faizani was detonated in the Chel Siton area. The official said Faizani and five others were injured. It was the first attack in Kabul since the start of holy fasting month of Ramadan on June 6. The last attack in the Afghan capital on 04/19/2016 left 64 dead and more than 340 wounded. That attack was claimed by the Taliban, which has fought the Western-backed Kabul government since the group were ousted from power by a US-led invasion in late 2001 – Operation ‘ Absolute Justice ‘.